To place in loving, caring homes, Flatcoated Retrievers who, due to unfortunate circumstances, require rehousing and to assist where possible with welfare matters concerning Flatcoated Retrievers. The Scheme will assist any Flatcoated Retriever and its owner/breeder in confidence, whether or not they are a member of the Flatcoated Retriever Society. The scheme operates on its own merit and is self supporting through fund-raising and donations. Our Code of Practice also allows for funds to be donated for worthwhile canine causes that benefit the welfare of Flatcoated Retrievers. 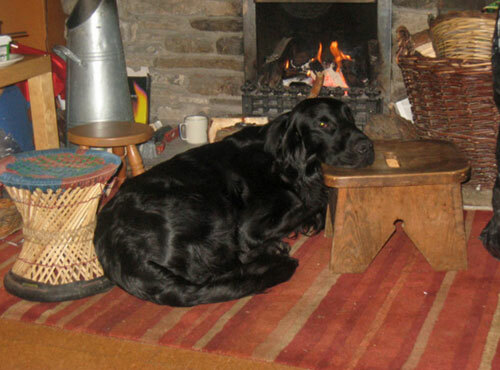 The Scheme, although part of the Flatcoated Retriever Society operates on its own merit and is self supporting through fundraising and donations. Breed rescue and health are two of the most important aspects of any breed club and we are proud to represent not only the Society but also The Northern England Flatcoated Retriever Association, The Flatcoated Retriever Club of Scotland, The Southern Flatcoated Retriever Club, The Irish Flatcoated Retriever Society and Flatcoated Retrievers of Ireland in all rehousing matters. The Scheme operates through a National Co-ordinator with Area Representatives throughout England, Scotland, Wales, Northern and Southern Ireland. Annual registrations for Flatcoats average around 1400 per year and the number of dogs we rehome varies between 35 to 45 a year although we have some years rehomed over 60. In the main Flatcoated Retrievers are rehoused for very genuine reasons; Owners ill health, death, divorce and associated problems with the dogs such as over boisterousness. However not all of the cases we deal with are what you might call genuine. In the past we have we have taken Flatcoats from commercial breeders whose dogs usefulness have come to an end, dogs with some of the worst neglect you could imagine in a Flatcoat and puppies for want of a better word ‘miss sold’. Some of these dogs had to undergo long periods of rehabilitation and in some cases extensive veterinary treatment to get them to the stage where they could be successfully rehomed. Our policy on rehoming when two dogs from the same family need to be rehoused is to home them together unless there is a good reason to separate them even if one of the dogs is not a Flatcoat. This can sometimes be a problem finding a suitable home but the benefit for the dogs is usually worth the extra effort. The scheme normally rehouses dogs in one of two ways either assisted rehoming when a dog is rehoused directly from one home to another, this very much depends on the owners circumstances and that of the dog, or the dog will come directly into the Scheme. We are lucky that the National Co-ordinator owns his own boarding kennels and is able to take in dogs either in an emergency or if the dog requires assessment or retraining. All new homes are assessed for their suitability. The Langford Trust, Bristol University Veterinary School towards Throscopy Equipment. The University of Glasgow Veterinary School for the Purchase of a Tonometer used in the diagnosis of Glaucoma. The AHT to purchase a digital camera to connect to their Oncology department microscope for the study of tumours. The AHT to purchase a freezer to store Flatcoat blood and DNA samples. A fund was set up to help finance a Genome Scan and medical research for Flatcoats. This fund now stands at £6,000. The Royal Veterinary Collage to help cover the cost of a Heart By-pass operation on a young Flatcoat. The AHT appeal to help purchase a Endoscopic Cyvlophotocoagulation (ECP) to help in the treatment of Glaucoma. National Co-ordinator Jenny Morgan or in an emergency or need advice, contact the Schemes representative for your area.